Nick and Justen with some nice fish from a Thrasher trip with Jason on Monday. The great fishing continued once again this past week. 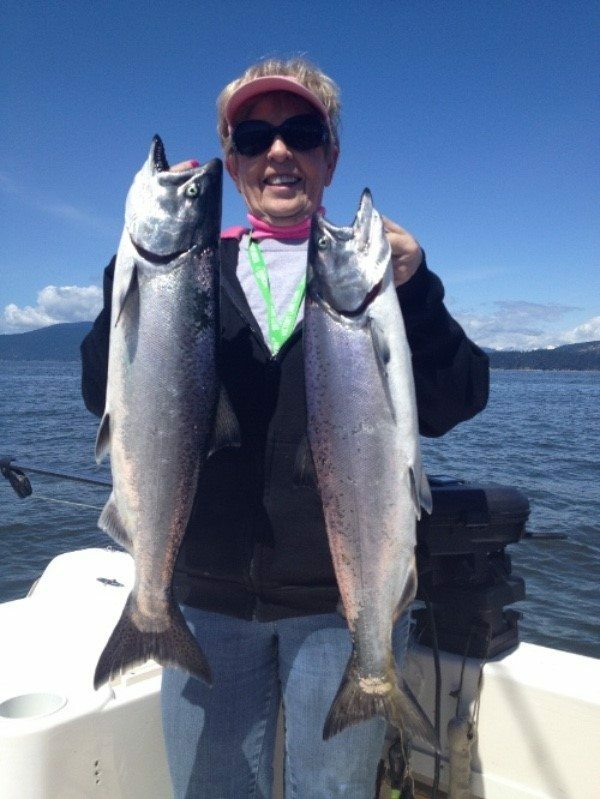 I can’t recall a season with such consistent spring time chinook fishing. If you look back at past reports from April and May you can see the fishing has been good for about 6 weeks now and I don’t anticipate this changing anytime soon. It is only mid May and just know we are getting into peak season for Thrasher and there are still lots of fish around at the QA and Bell. 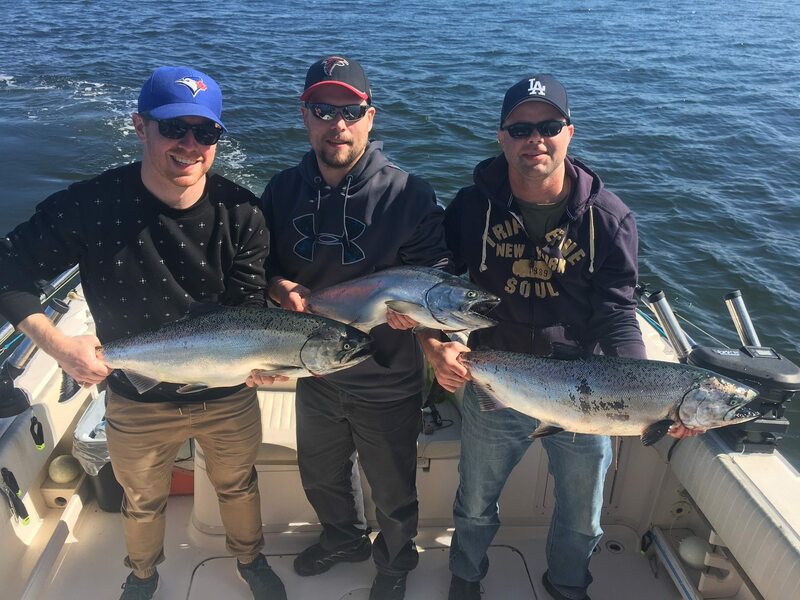 Pat with some beauties caught on a local trip this week. Here is a basic recap of the week. Last Friday fishing was really good over at Thrasher and I was the only boat there, so definitely not crowded. Saturday it was too windy to get across so we fished the QA to the Bell Buoy and we boated 4 nice fish and even had a double header and Eddie had similar results. Sunday morning the ebb tide was slow in local waters and eventually the winds died down and we went to Thrasher and found some nice fish on the flood in the afternoon. The action also really picked up around the QA to the Bell in the afternoon on the flood tide that day. Monday was one of those special days. Limits in the boat by noon and a killer whale show on the way home as a pod of transients ate a seal just off the Hump. Boat maintenance on Tuesday and Wednesday for me, and back out to Thrasher on Thursday and the fishing was awesome. So except for one slow ebb tide on Sunday morning, the fishing has been extremely good. Too windy for Thrasher? No worries, lots of chinook off the Bell Bouy Saturday. Locally the Hump has only been so so, a few fish here and there, and the QA to Belly Buoy area seems to be as good or better. The hot zone is definitely 90-110 on the riggers and glow flashers with bait or spoons have been the top producers. Over at Thrasher the hot depths for me have been 135-175 on the riggers. I am happy to report that on Thursday night when we were fishing there that the algae and jellyfish finally seemed to be thinning out. I think the bigger tides are clearing it out a bit, at least for now. Some nice springs from Sunday afternoon at Thrasher. As you know, “Thrasher” is a big spot. We have been fishing offshore and on the structure, with mixed results up on the structure. It is still a bit early to be fishing structure and grinding bottom in my opinion. 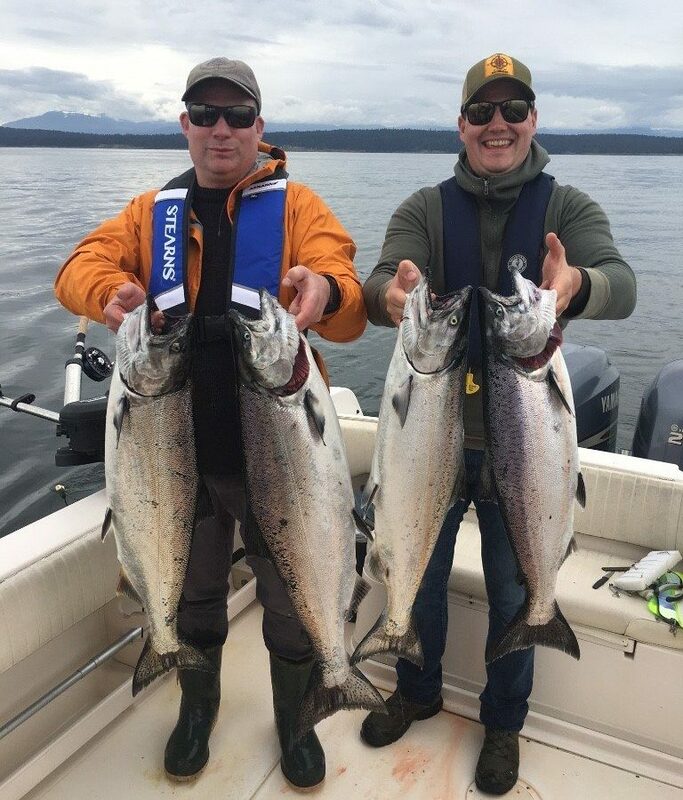 I was reviewing our fishing journals and some of our record days at Thrasher have been on May 15 and May 17 and they were offshore in 600 feet of water anywhere from Entrance down to Thrasher. So don’t give up on the offshore fishery just yet, it is a big piece of water to cover and you have to put in the time to find them. A classic example is on Tuesday. I was working on one of the boats but Eddie was guiding some clients from N. Carolina on a Thrasher trip. 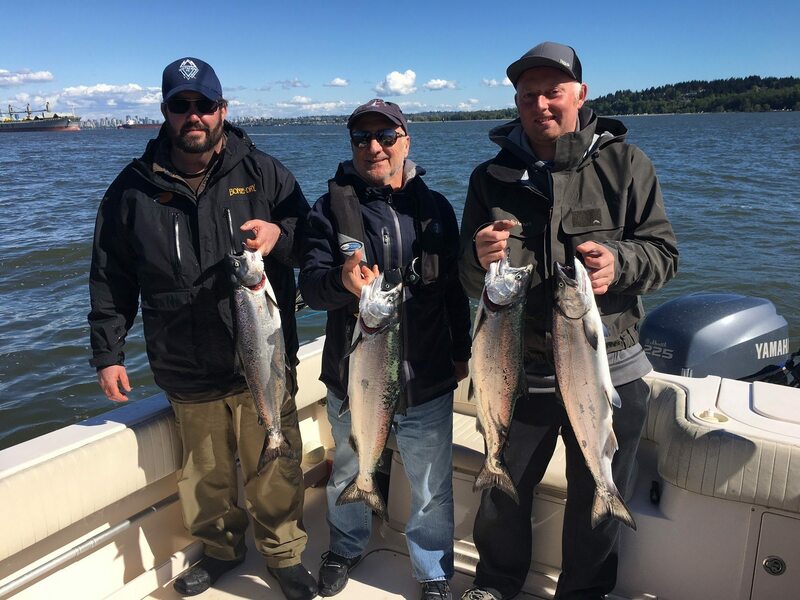 It was slow all morning on the ebb and up on the structure, but offshore in the afternoon, on the flood tide, Eddie got on a school of fish and was into double digits and easy limits. Such is the nature of this area, it is huge and the fish move around a lot. As usual, hootchies have been excellent producers, as have spoons. The herring in the area right are in the 5 to 8 inch range so bigger spoons are working. We have been getting savage takes on 4 inch and 5 inch spoons. As mentioned in last weeks report, a Tomic plug is also a good choice if you don’t want to fish with flashers. 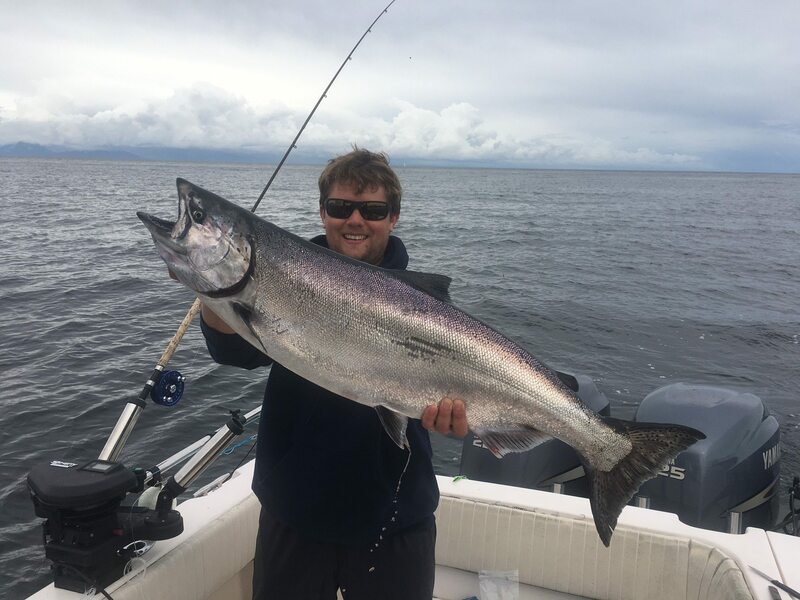 Pacific Angler Guide Thomas Northcote with a nice fish from Thrasher on the Thursday night flood tide. 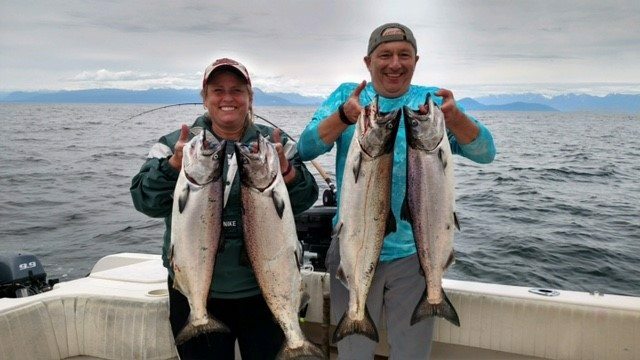 Rob and Lisa with their catch from a trip to Thrasher this week with Captain Eddie. Commercial prawning has opened up so we won’t be dropping prawn traps anymore, but the crabbing has been decent. If you would like to book a trip give us a call at 778-788-8582 and make sure to follow us on Instagram for mid -week updates. As usual, drop by the shop for expert advice on all the top producing flashers, spoons, and hootchies.